Red White And Win Progressive Jackpot Slot Guide & Review - Casino Answers! 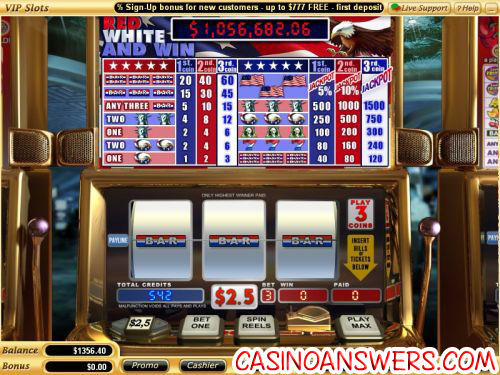 Red, White and Win is a 3-reel, 1-line progressive jackpot slot machine developed by Vegas Technology. You can play Red, White and Win at US-friendly Vegas Tech casinos Go Casino and Super Slots Casino. To state the obvious, Red, White and Win has a an patriotic American theme. This is reflected in the symbols, which include bar symbols (with red, white and blue backgrounds), red, white and blue 7’s, George Washington (from the dollar bill), a Bald Eagle, the Statue of Liberty and Star-Spangled Banner flags. Red, White and Win is a $2.50 fixed value slot machine. You can bet up to 3 coins, so you can bet $2.50, $5 or $7.50 per spin. You will be eligible for 5% of the progressive jackpot on 1-coin bets, 10% of the jackpot on 2-coin bets and you will be eligible for the entire jackpot on 3-coin bets. Casino Answers recommends you go all out and play the maximum bet. Otherwise, you might as well play Pay Dirt or another one of Vegas Tech’s progressive jackpot slots. The most important aspect of the Red, White and Win slot machine is its progressive jackpot. It is one of the largest jackpots online and is currently at over $1,000,000 at the time of this writing. To win this jackpot, you must line three American flag symbols on the center payline on a maximum coin bet. You can win the Red, White and Win Progressive Jackpot at Go Casino! Payouts on the Red, White and Blue progressive slot machine are (1/2/3 coin payouts in parenthesis): 1 Bald Eagle symbol (1/2/3), 2 Bald Eagle symbols (2/4/6), 1 Statue of Liberty symbol (2/4/6), 2 Statue of Liberty symbols (4/8/12), any three bar symbols (5/10/15), 3 single bar symbols (15/30/45), 3 double bar symbols (20/40/60), 3 triple bar symbols (40/80/120), 3 7’s (80/160/240), 3 dollar bill symbols (100/200/300), 3 Bald Eagle symbols (250/500/750), 3 Statue of Liberty symbols (500/1000/1500), 3 Star-Spangled banner symbols (5% Jackpot/10% Jackpot/Jackpot). You can win Red, White and Blue’s top fixed jackpot by lining up three Statue of Liberty symbols on the payline. By doing this, you can win up to 1500 coins or $3,750. The average jackpot on the Red, White and Blue progressive jackpot slot is over $900,000. Just for the possible chance of hitting those three American flags in a row, you might be tempted to try this one out for yourself. For what we consider the best online casino bonus around, you can get up to $20,000 on your first twenty deposits at Go Casino! Are Americans able to play the Red, White and Win progressive jackpot slot? Yes, Americans are free to play Red, White and Win at any Vegas Tech online casino, including both Go Casino and Super Slots Casino. How do I win the Red, White and Win progressive jackpot? To win the Red, White and Win progressive jackpot, you must play all three coins (a $7.50 maximum bet) and you must line up three American flag symbols on the single center payline. Good luck! Can I play Red, White and Win in practice play? No, Vegas Technology does not allow players to try out their progressive jackpot games in practice mode. To play Red, White and Win, you must be a depositing player with a balance. Do I need to download any software to play Red, White and Win? Super Slots Casino gives you the option of downloading their software or playing their Flash instant play casino. If you don’t have Flash installed on your computer or you have any problems playing the Red, White and Win Flash game, you can download the newest version of Adobe Flash Player. What American based slot machines are there?